The rain never stops falling on Satellite Reign’s isometric future-city. It’s derivative of countless cyberpunk cityscapes, but an amazingly atmospheric place regardless. Video advertisements cycle on huge billboards, the images reflecting in puddles on the pavement below. Police drones float past, spotlights scanning for trouble in the gloom. Sleek futuristic cars buzz along the roads and augmented citizens roam the streets. It’s like Blade Runner if Ridley Scott had filmed it with a tilt-shift lens. It’s in this dystopian urban sprawl that you, a small corporation with big ideas, must make your mark—which is easier said than done when rival mega-corps and their military-grade security forces have a monopoly over everything. Starting in the downtown area—a bustling, labyrinthine sea of neon—your path through this open-world city is carved by you. You can do missions in any order, in any way you please. The action is viewed from above, and you control your four customisable super-agents with traditional RTS controls. It’s reminiscent of XCOM: Enemy Unknown, but real-time rather than turn-based. You can dash into cover. Your accuracy in a gunfight is determined by your range and weapon, an enemy’s position, and the abilities of your agents—which can, of course, be upgraded. You can flank enemies to get the jump on them, snipe from afar, or charge in for a melee attack. 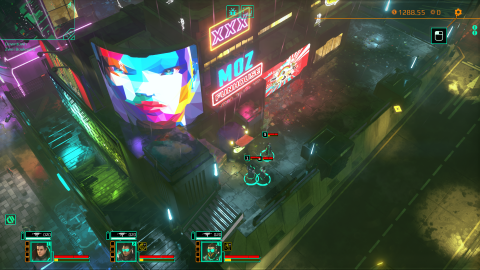 But while games like XCOM and Shadowrun limit you to closed-in levels, Satellite Reign’s open city lets you seamlessly move from the anonymity of the streets, where you can hide safely among the bustle, to a mission: attacking a rival corp's factory or robbing a bank. These guarded spaces are levels of a sort, but they sit in the open-world waiting to be attacked or infiltrated as you see fit. If you have the cash you can buy intel to make your life easier: like, say, an unguarded side entrance. It’s daunting at first. The starting area is enormous, and there’s so much intricate detail on those rain-soaked, maze-like streets that you can feel lost. It’s when you see a thick wall, gun-toting guards, security cameras, and warnings to stay away that you know you’ve encountered somewhere you can assault or rob. Entering a restricted area triggers a GTA-style ‘wanted meter’ with increasing levels of severity, so you either have to stay hidden or prepare yourself for the corp’s security to retaliate. You have four agents, but that doesn’t mean you have to use them all. The most satisfying moment for me was deciding to rob a bank with the security of Area 51, and managing to pull it off with one character: a Hacker. I carefully, meticulously hacked my way through security gates, dodged cameras and patrolling guards, and made my way towards the main building. I slipped inside and hacked their systems so that ‘syphons’ I’d attached to ATMs around the city would generate more money. Then I snuck out, and the corporation I just ripped off was none the wiser. That’s just one way, though. I could have fought my way to the main building with all four agents’ guns blazing, then sent my Soldier in to grab a big pile of money for a more immediate reward. There are no interiors in the game: these moments happen off-screen, with a text summary of what your agent did inside. But considering the size of the city, I don’t mind. Combining your agents’ skills, augs, and weapons, and choosing how to approach a mission, is when Satellite Reign is at its best. My biggest complaint is how the game feels. It has none of the punchy, kinetic weight of XCOM or StarCraft, which isometric, top-down games like this really need to sell their combat—to compensate for your distance from the action. Your agents’ movement is slow and heavy, making battles feel sluggish. It’s a hard thing to articulate in words: it just lacks that slickness that many of its peers have. It’s also light on world-building beyond its visuals, with a plot and setting that aren’t as fleshed out as they could have been. If it’s an engaging story you want, try the Shadowrun series: this is a game about the stories you create by playing. These are issues that haunt every moment of play, but otherwise, Satellite Reign is one of the most enjoyable small-squad strategy games I’ve played in a long time. I love how it blends tactical combat with an open-world structure and Deus Ex-inspired freedom. Creeping through a heavily defended enemy base unseen is a thrill, and if things go awry, there are lots of combat options to experiment with. Messing up is never a bad thing, because adapting and surviving is so much fun. Then you slip back into the darkness of those rain-lashed streets until the heat dies down, and you search the map for the next bank, military facility, or police station to hit.